Next time you go to renew your driver’s license, there may be a smiling face there to greet you. You might then step up to a sleek self-service station to quickly process your paperwork. And if you have problems, you could bank on there being a local staff member; perhaps even one who speaks your native language if it’s not English. One third of the existing self-service kiosks weren’t working, employees were working overtime regularly and some visitors were waiting hours for help. “In many situations I was frankly devastated to see the challenges that some of the branches were facing,” she said. Over the coming months and years, Benson said she plans to implement a wide variety of fixes she hopes will modernize the office’s interactions with residents, smooth branch operations and achieve her central campaign promise of a 30-minutes-or-less guaranteed wait time when residents visit their local branch. That will include targeted support for high-volume customers such as car dealerships, improvements to self-service kiosks for renewing license plate tabs or watercraft and motorcycle registration, and possible changes to branch locations and amenities in some urban areas with limited available parking. She also hopes to explore options for multi-year license plates and automatic driver’s license renewal, she wrote in an accompanying report detailing her plans. Benson also hopes offices will “celebrate local communities” by being more responsive to local needs. When she visited the Dearborn office, she said she saw Arabic-speaking customers were having trouble getting the service they needed because none of the office employees spoke Arabic. After her visit, Benson said, the branch quickly hired two Arabic-speaking employees. Since beginning the tour, Benson said her office has already changed the MI-TIME appointment system, which allowed customers to get in line remotely and receive updated time estimates for how long their wait would be. The system was reporting dramatically inaccurate wait times and causing “deep frustration” for customers and employees, she said. Now the system simply shows people their place in line, allowing them to decide when to return to the office. Benson did not directly address a question about how much the planned changes might cost, saying only that she is a “fiscally conservative leader” and hopes certain changes — such as using the self-service stations to cut down on the state’s $7 million postage costs to, for instance, send registration forms to customers — will save the state money. The department’s problems are the result of “too many short-term solutions” over years, Benson said. Benson’s predecessor, Ruth Johnson, first implemented many of the services Benson says she wants to improve, such as the MI-TIME system and the self-service kiosks. Less than a week before a trial is expected to start, federal judges paved the way for a landmark showdown over Michigan’s legislative districts, which Republicans drew and Democrats have derided as unfair. Former state Senate Minority Leader Gretchen Whitmer has the most endorsements so far in the Democratic field for governor, including from more than a dozen labor unions. Build a Better Michigan and Gov. Gretchen Whitmer’s campaign committee engaged in express advocacy, Democratic Sec. 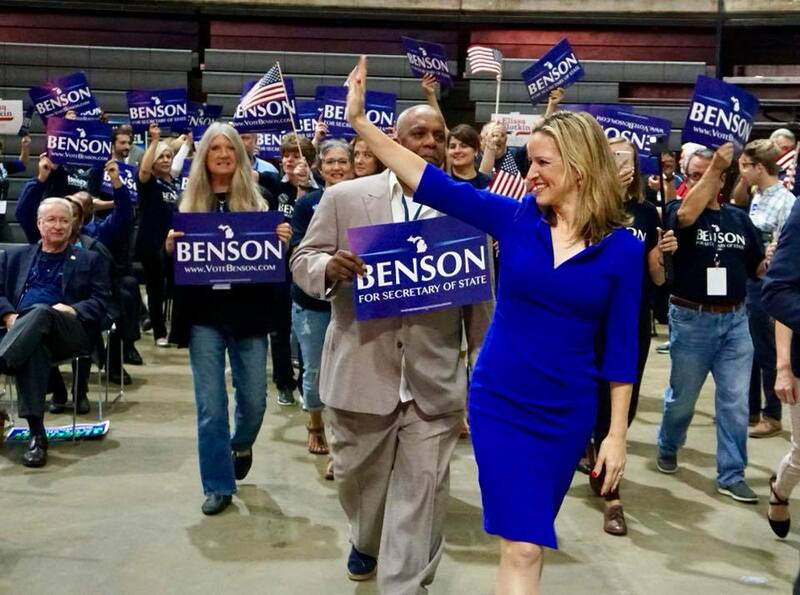 of State Jocelyn Benson announced Friday, and must pay pay a $37,500 fine. Whatever your opinion is of Sec. Benson or her proposed policies, 131 branch office visits in a span of 2-months is impressive! Just don't consult with Rick Snyder on technology. He has a track record in both the private and public sectors. Boy you are spot on with that comment. I go to the Secretary of State branch at the Frandor Shopping Center in Lansing. It has actually improved a lot from what it used to be like, I think it went reasonably fast. A 30 minute wait time is not realistic, it is not a process that people should expect to go really fast since every time I have went there it has been very crowded. The wait time at the Redford SOS on Joy Road and Beech Daly Road is hours at a time - always! Go girl. Wait times are unreal every time I go to port Huron office. Hour and a half at Fenton road, flint. 45 people ahead of us. As long as the wait was, they did move a lot of people through in that time. I live half way between Petoskey and Cheboygan and the wait time is about the same in both but smiling faces, courtesy and helpfulness only exists in one office! Anyone who has been following Jocelyn Benson knows of her commitment to making government work better for the people. I had not heard of her visits to SOS offices, but this is typical of her understated leadership style and commitment to the public servants who do the daily work of her office. The online system isn’t much better. I was given a PIN number for watercraft renewal and when I tried to renew, it said it was the wrong number. I called SOS and they said they had a system conversion, but everything didn’t transfer. So I had to mail it in and wait two weeks for the tab. Why can't Betsy DeVos put the same effort in visiting public schools in Michigan? Well done, Benson. Betsy DeVos is probably terrified to set foot in a Michigan school, esp a public one. For good reason...she may be chased out by an angry mob. She's a coward. Renewing driver's license not possible online (the system was not ready to accept my card) so went in to the South Kalamazoo County branch and it took a total of 10 hours over two days to complete the transaction. Another patron said there was some deadline for a specific class of vehicle which just happened to coincide with my birthday. After having left the branch office twice previously due to 3-4 hour predicted wait time, my husband was there when the office opened. He was 7th in line and had a 2-1/2 hour wait! Totally unacceptable! Online appointments aren’t available in our county and his task couldn’t be done online. Not happy this morning when I went to get in line online this morning!! !